First up Michael Stewart and I covered off the GS750V, where we are at and where we plan to take it as low volume manufacturing options are explored. 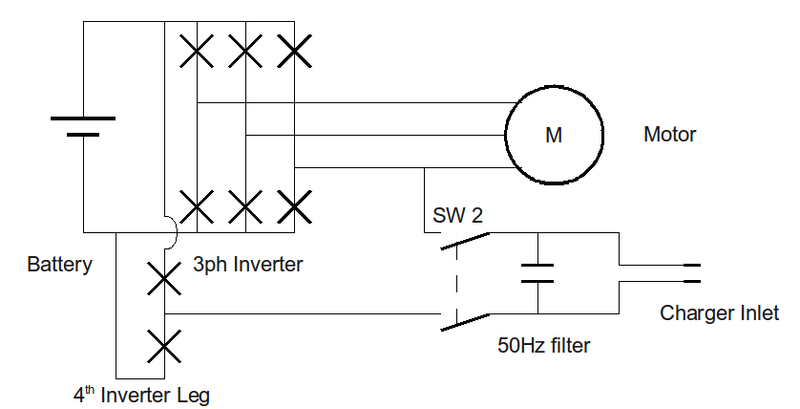 This included vehicle mechanicals, the Inverter and BMS development (with reference to the Tumanako project, the home of this technology) and battery technology options. As you will know, the battery technology in a vehicle like this is essential to the end result and we are not willing to compromise with our technology or business relationships on this front. It's early days yet, but we think we have finally found the perfect solution to the dilemma posed by the requirements of the GS750V. 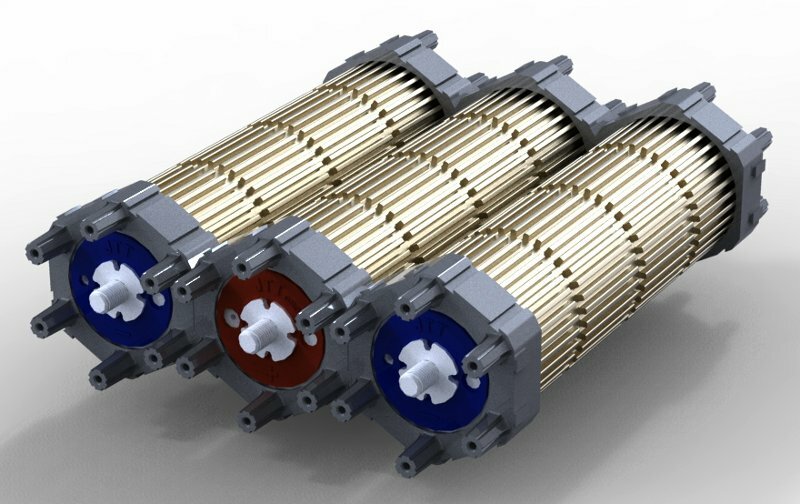 We recently became aware of a new 20Ah Lithium Iron Phosphate cell capable of 300A continuous. These cells are definitely in the sweet spot with respect to our energy and power density requirements. We expect to have sample cells in January for BMS tuning and development. Stay tuned for updates on these puppies! 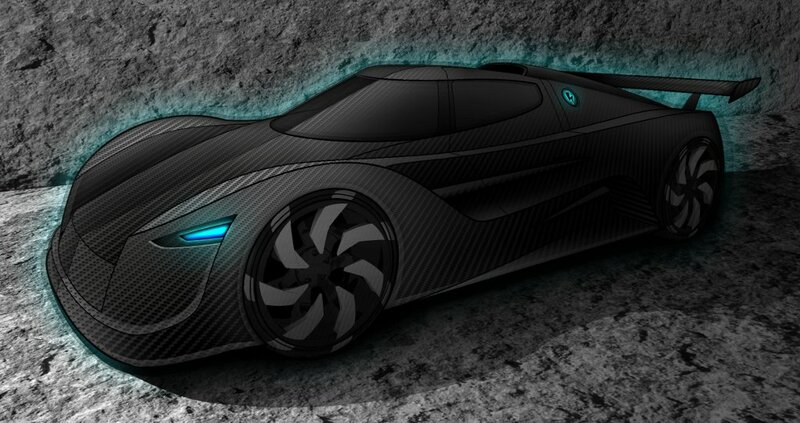 Michael also gave us a sneak preview of the Saker GT and Stewart Zen inspired MKII look for the future. There is a lot of potential here. Secondly, Ed presented the combined AC Controller, Charger and V2G design which has been released as part of the Tumanako project. Not only does this remove the need to lug around a separate charger or to hunt down a compatible charging station, it will also be significantly cheaper as it utilises the same hardware required to drive the vehicle's electric motor. All of a sudden, not only can your EV charge itself from any power socket, but you also have a UPS on wheels! After a break for BBQ lunch (kindly provided by TradeTech), John Gorman and Matt Magoffin presented the SolarNetwork's progress. 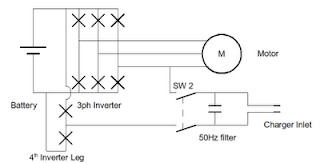 After back-grounding the project and software architecture for the Open Source smart grid John listed a range of new inverters being supported. He also showed off a few of the physical configurations being developed by Greenstage Power for the purposes of supporting distributed generation companies. 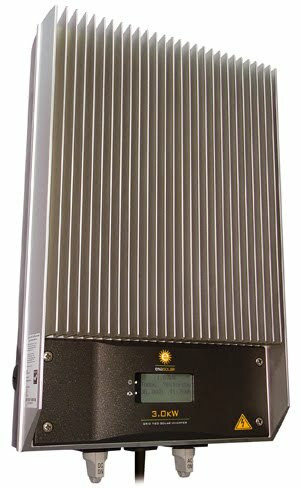 One of the new grid tied inverters to be supported by the SolarNetwork in the new year is from Enasolar. These amazing inverters will be forming a central component of an engineering and technology show room we will be putting together early next year. A particularly note worthy announcement from John, was that the NZ Solar Decathlon team have chosen the SolarNetwork as the framework for their FirstLight Energy efficient design. The NZ team is the first ever southern hemisphere team and they have been selected as one of 20 international teams to compete in the U.S. Department of Energy Solar Decathlon 2011. We will be backing these guys full on, so expect to see more success and Kiwi can do attitude on the world stage next year! Finally I just wanted to give a heads up on a number of exciting but unrelated things that came out of the day. 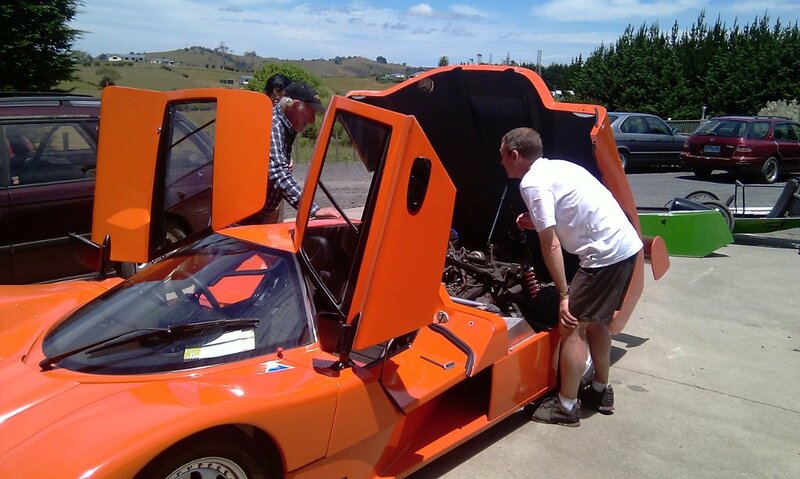 1) Mike Duke from the University of Waikato announced plans for the first ever NZ EV rally from Cape Reinga to Bluff, starting on Sunday the 22nd of January 2012 (just over a year away). The event will focus on vehicle efficiency, practicality and fun. To be held over one week, with a number of preplanned stops along the way, the rally will be an event not to be missed. The event will cater for both NZ and international teams wanting to demonstrate their technology and compete in a real world environment with controlled and measurable outcomes. More details will be available in the new year, contact Mike Duke (dukemd@waikato.ac.nz) for information or to register your interest (Greenstage will be there!). 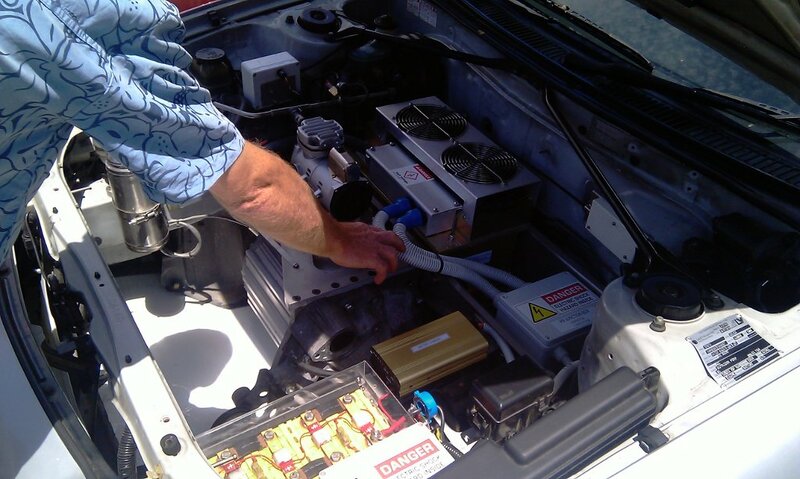 2) Jason Whaanga from Advanced Eco Solutions had some Life Batt cells on display and also had a pack being put to good use in a vehicle called the Scarab EV. 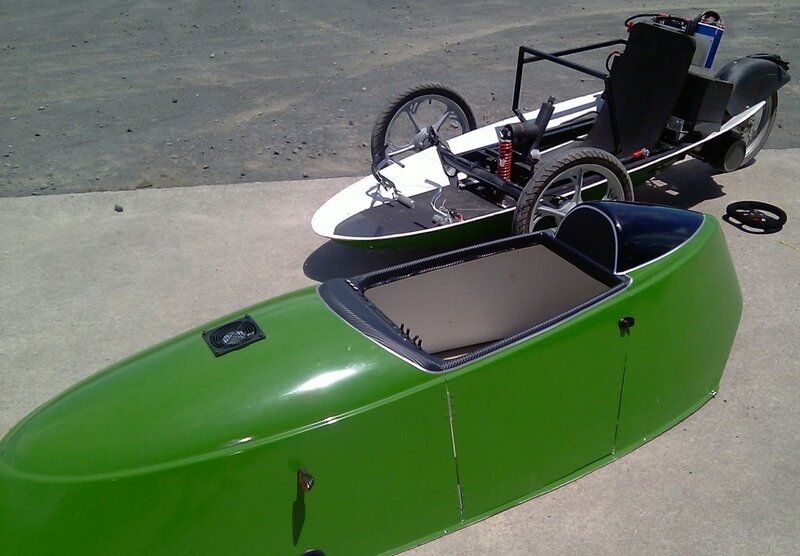 Here is a picture of it with its lid off (yes its a single seat three wheeler). 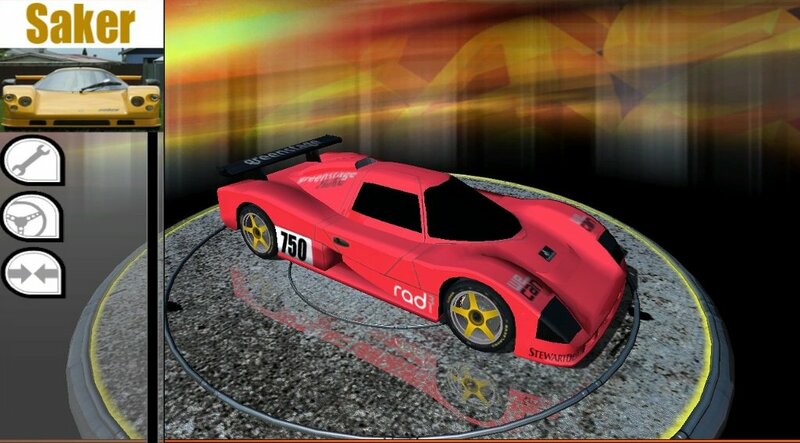 This is the first of its kind and the plan is to standardise the build process and provide kitsets to the public with the possibility of establishing a cost effective Scarab EV race series. I'm keen to see this happen! Its a nifty little vehicle that will leave a smile on your face. 3) rFactor ! For those that don't know, rFactor is a very realistic racing simulation game. We have wanted to see the GS750V in rFactor for a long time now and it's finally been done. Big thanks to Dave and Brendan for providing and showing off the first ever Electric Saker Mod. It's still a work in progress but as a first cut these guys have done an amazing job. The only major flaw I could find was that the well presented GS750V sounded and performed suspiciously like it had an internal combustion engine!? 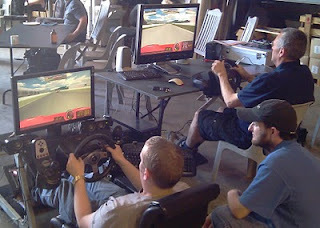 :) A number of different people had a virtual drive over the day including myself, it was a lot of fun! 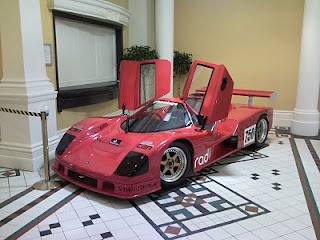 There were plenty of other things happening and being discussed (such as Peter Sewell's very tidy electric Celica and Bruce Turnbull's not so electric Saker GT) and these were just some of the highlights from my point of view. I know I've missed a few (e.g. the fact that Alan took out the Formula E go carting final with ease after narrowly avoiding the marshal's dreaded go-slow button), so if you had your own personal highlights, please feel free to comment on this post to share your experience. Again, a big thanks to the Greenstage crew, Stud Welding and to everyone else who was present and contributed to the day. Your ideas, contributions and discussions are what makes these events worthwhile. With a collaborative approach and open technology we can all expand our horizons for a better world. Better business, better technology and better results. Expect to see a glimpse of this in the new year. John Gorman (of SolarNetwork fame) and I are speaking tonight in Auckland at a joint IET and ESR meeting. Our topic is "Renewable energy, Smartgrid and Electric Vehicles as they fit into an open-source context". Details on the talk are available here. This is the first public airing of where we are heading with Greenstage Power (a subsidiary of Greenstage), as we move to leverage SolarNetwork (and to a lesser degree Tumanako) technology to offer serious commercial solutions for distributed generation and demand side response services using Open Source technology. If you are in Auckland come and check it out, its a free event. This optimism proved to be slightly misplaced as we uncovered a couple of unexpected digital IO issues and a motor configuration and/or DC supply not up to establishing a baseline set of figures from the dyno. So not 100% happy, but given that our goals for the day included equipment familiarisation and commissioning the rectified DC supply, it was still a valuable exercise. Big thanks to Ed, Mark, John and the Wintec team for making the day possible. 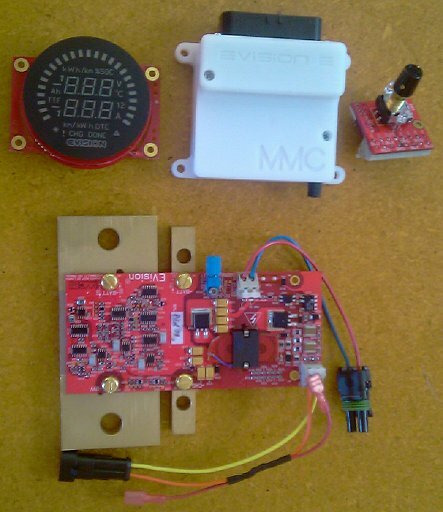 Next up, a test rig for the GS750V's WS28 Motor (1.1kW test rigs only go so far), a bikini pack (2 minute hill climbs) and more Open Source inverter progress (bring on the KiwiAC!). Killacycle. Standing 1/4 mile. 4th run. Motueka NZ. 6/2/10. from Paul Tuffery. The Video Guys on Vimeo. Quick update (photos to come soon). 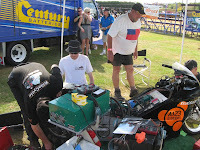 Scotty and the KillaCycle managed a 8.81 sec without the series parallel shift working so this was a very good result! The rain radar looked good though, so we headed for the track with the KillaCycle safely tucked up inside Athol's Stud Racing rig. Once the rain cleared Bill and the team bought the KillaCycle out for everyone to see. A few people who knew what the KillaCycle was came over to have a chat while the bike was prepared, but most of the big crowd wandered by. Just before lunch the weather and the track had dried up enough for us to give the thumbs up to the track officials. Athol made sure Scotty was primed for the Meremere track and everything was ready to go. Sadly just as Scotty was about to do the run the rain started again! Bill called the run off as it is not safe to run any bike even with the slightest amount of rain on the track. The bike was taken back to the gazebo to keep it dry. Now that the crowd knew about the bike, we started to get a bit more interest. The message was out! After lunch the weather cleared again and we planned to do a burnout at the very least and if the rain held out to do a run as well. Luck was on our side this time. 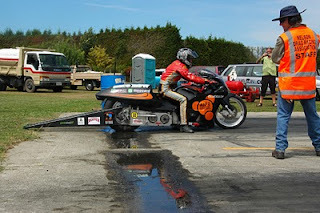 Being the first ever run for Scotty and the Bike at Meremere, Bill had setup the Zilla (the controller on the bike that feeds power to the motors) to provide a little over half what it is capable of. The end result a 12 sec run. Nothing world beating, but everything was still in one peace and Scotty had a feel for the track now (he wanted more power from Bill!). Back to the pits to top things up and wind up the power a little more (Bill pushed it up to about 80%). The 2nd run was faster out of the hole, but one of the motors gave up and spat out some plasma half track. Not a good sign, the run was clocked at 10 sec. Back at the pits you could smell the dead motor. Bill had been running new high voltage motors for the first time so it was a bit of a learning experience here (not as good as he hoped for). The afternoon was getting late, so not enough time left in the day to change the motors so the decision was made to pack up. 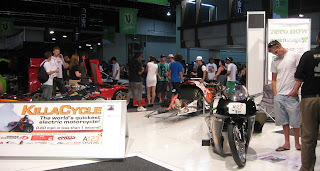 The 4 and Rotary Nationals was fun and the young crowd seemed to appreciate what the KillaCycle is all about. Just a pity it didn't reach its potential on the day. The good news is that the bike is now all fitted out with the good old tried and tested motors (the same style as used for the record setting 7.8 sec run in the US). We head to Nelson today, so expect to see the 10 sec time set at Meremere beaten by quite a margin on Saturday! OK, missed a few days in the blog. Here is the summary (check out Eva's blog for more details). Great weather, great people, awesome fun! These guys have great facilities and the people that turned out were very tunned in to the technology. Plenty of interest here in Hamilton. Wicked event, people and cars everywhere and some amazingly well presented cars! We were presenting from one of the center stages so we got lots of traffic and attention. Plenty of people already keen on electric vehicles and those new to the technology seemed to be either confused, stunned or worried when they heard about the performance potential! Tomorrow is the big day though. The rubber hits the road as the KillaCycle is given a chance to do the business in its first outing in NZ. Scotty (who arrived in NZ this morning) will be charged with driving the KillaCycle to find out. 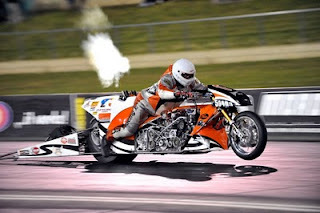 Can he beat Ian Wilkin's and Afterburner, his high octane nitrous injected bike? 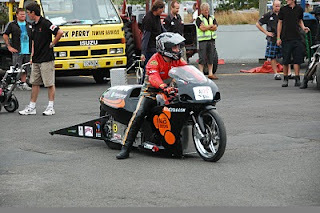 Come and see it all at Meremere tomorrow (the KillaCycle is racing at about noon)! We have had a brilliant day here today in Palmerston North. After being introduced to everyone Eva was happy to be in NZ and quickly emersed herself in the event and everything that was going on. The ZeroNow event was situated in the open area in front of Te Manawa and it included a diverse collection of technologies many demonstrating high efficiency and high performance in the same package. Of course Eva, Bill and the KillaCycle fitted right in. Here Eva is attaching a couple of the NZ tour sponsors logos (ZeroNow and ECONZ Timecard) to the KillaCycle. With all the energy efficiency being demonstrated, Athol felt he needed to take up a bit of the slack. He fired up his nitro methane powered bike to check that no one was asleep and to ensure that as a group we were contributing our fare share of emissions. That cleared out the ears! 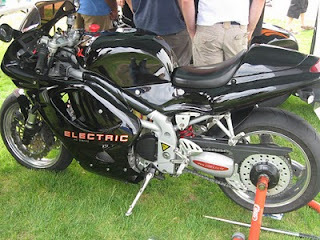 The KillaCycle was not the only high performance electric bike, Iain Jerrett had his electric road bike on display as well. What an amazing job he has done! This is a very professional conversion. Check out the details on his website here. Big ups to Athol, Bill, Eva, Tom, Tabitha, Ed, Craig, Andrew and Jon (and everyone else in this extended team). These guys are all committed to making a difference, they are amazing people! Thanks also to everyone displaying products or who came along to see what was happening. It was a big turn out and I know we all had a lot of fun. The KillaCycle Tour just keeps getting better! Just a parting shot as we left Te Papa on Sunday evening. Athol's bike in the foreground and the KillaCycle at the back. Good bye Te Papa! Thanks to all the wonderful Te Papa staff and all the people that came to see us, we had a lot of fun. Sadly, the KillaCycle will no longer be on display in Taupo. Bill, Eva, Tom and myself will still be stopping off at Roberts Reserve in Taupo with the Electric Saker and Tom's Electric Mini to talk about EV's the KillaCycle and anything else related, so please do drop by to say hello. If you want to see the actual KillaCycle, I suggest you either come to Palmerston North on the 25th Jan, or Hamilton on the 28th Jan where it will be on display. Even better come to Meremere on the 31st Jan and see it in action! 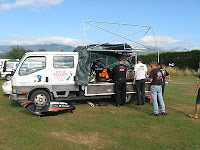 The GS750V (Electric Saker) is in the Wellington town hall today as part of the LCA2010 open day. Come down and see Tom and I between 11am and 2pm today (Jan 23rd). Tom has his electric mini on display as well and we are both show casing Tumanako technology. Just a quick note to let you know that the KillaCycle has made it to Te Papa! It's there until Sunday Evening (Jan 24th). Come down and meet Bill Dube and Athol Williams (Athol also has his record holding top fuel drag bike on display). There is still motor tuning and other refinements to be done, but I think the test battery pack is going to be our limiting factor from here on. 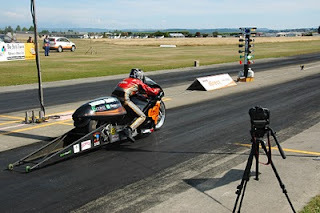 The KillaCycle will be at the Classic Car and Hot Rod Festival in Kumeu this weekend (16th and 17th Jan) courtesy of Athol Williams and his top fuel drag bike (the KillaCycle will be sharing a spot with Athol's fire breathing beast). And just in case you missed it, we have confirmed the stop off in Taupo on Wednesday the 27th of January at Roberts Reserve and the drag racing in Nelson on Saturday the 6th February is all go! Check in on the Tour Calendar for full details. GS750V (Electric Saker) first drive! Guess what we did did yesterday? Yep, we drove the GS750V for the first time ever. It's still easy as we go stuff, with a 150V battery and software torque limits we wont be breaking any speed records but it is another significant step. The torque control was very smooth, transition from forward to reverse was perfect and we even managed a little bit of regeneration (we don't have our brake POT hooked up yet, but this can be achieved by selecting reverse while driving forward slowly). This was all achieved with the Tumanako vehicle controller interfacing with a Semikron SKiiP module.